Urban air pollution varies strongly both spatially and temporally, between e.g., polluted busy streets and cleaner parks or residential areas. Simulating urban air quality is very challenging and requires high-resolution simulations based on detailed emission inventories. 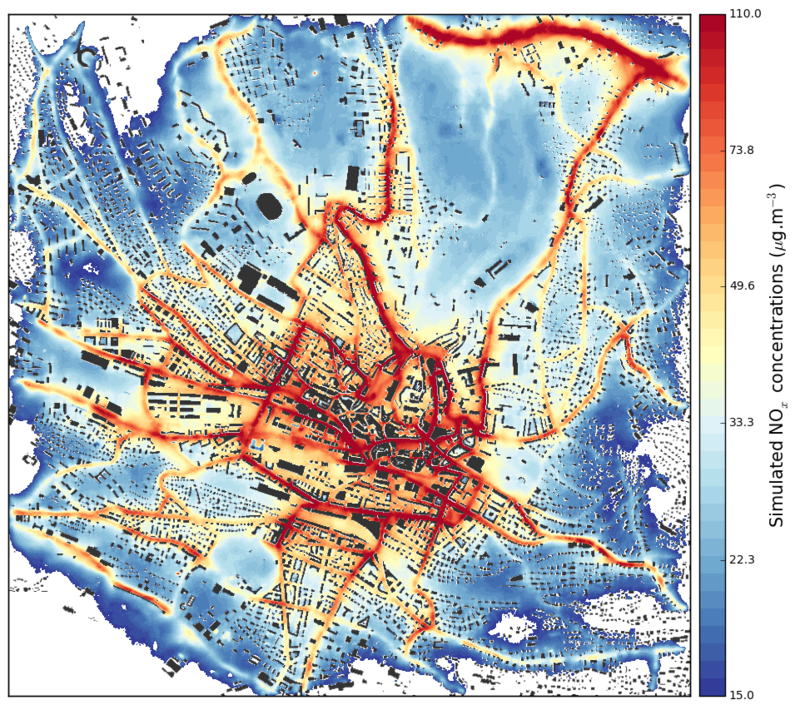 We use the GRAMM/GRAL nested modelling system to simulate the mesoscale flow in complex urban terrain as well as the dispersion of air pollutants down to building resolving scales. Specifically, we are investigating the air pollution in the two cities of Lausanne and Zurich in the framework of the project OpenSense 2 of the Swiss initiative Nano-Tera. Using the GRAMM/GRAL model system, we are producing hourly concentration maps of NOx and PM10 at 5 m resolution separately for different emission sectors (traffic, heating system, industry, etc.). These maps serve as a key input for health assessment studies. 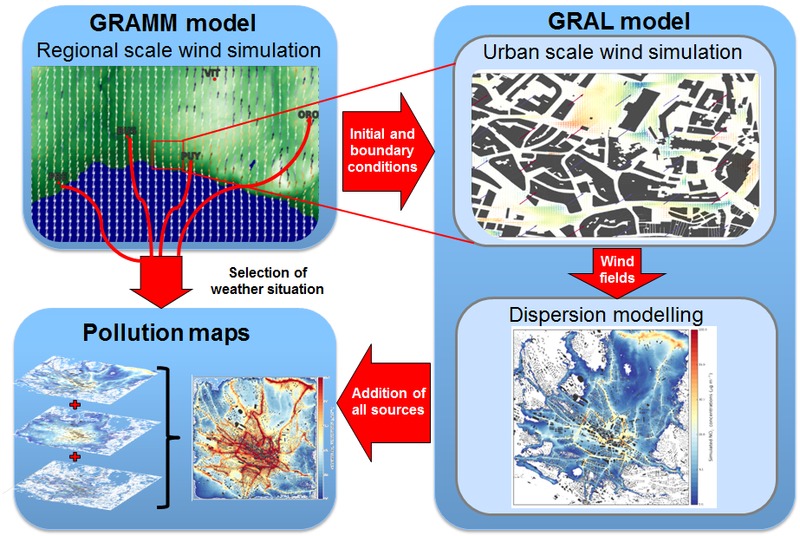 GRAMM/GRAL is a coupled Eulerian (GRAMM; Graz Mesoscale Model wind fields) and Lagrangian (microphysics Graz Lagrangian Model) model, developed at the Graz University of Technology, Austria, and supported by the Federal State Government of Styria, Austria. The complete documentation of GRAMM/GRAL is available here. Schematic of the modelling approach. GRAMM computes the mesoscale flow for a given weather situation and drives a nested GRAL flow simulation followed by a sequence of GRAL dispersion simulations for selected tracers. Simulating the full dynamic evolution of the atmospheric state in a whole city at building resolving scale and for long time periods would be prohibitively costly with current computing resources. To overcome this limitation, the GRAMM/GRAL system allows approximating the dynamic evolution by a sequence of hourly steady-state solutions. Generating this library of steady states still requires substantial resources, but once produced, the further computation of long-term series of hourly high-resolution pollution maps comes almost for free. For efficient and automated computation, we have ported GRAMM/GRAL to Linux and implemented the model on our computing cluster Hypatia. A library of reference states is generated with the NWP model GRAMM for a discrete set of background wind speeds, wind directions, and atmospheric stability classes. GRAMM computes the mesoscale flow patterns at a horizontal resolution of 100 m accounting for the influence of topography and of heat and water vapor exchanges with various land types and water body surfaces. In a second step, the CFD model GRAL is nested into a sub-domain of GRAMM model and solves for the steady state flow around buildings at a resolution of 5 m, forced at the boundaries by the GRAMM simulated fields. Based on the precomputed high-resolution wind fields, Lagrangian dispersion simulations are then performed within GRAL for a set of air pollutants (NOx, PM10) and polluting sectors (traffic, industry, heating systems, etc.) released according to an emission inventory. The result of this nested procedure is a library of 3-dimensional air pollution maps representative of hourly situations with no chemistry taken into account. Hourly concentration maps are then generated by selected one of the pre-computed situations according to corresponding observed meteorological parameters (wind speed and direction, global radiation) at observation sites (e.g., MeteoSwiss) within a radius of 20km around the city. Pre-computations are summed according to the contribution of each polluting sector (traffic, heating systems, industry, etc.) and to the temporal variability of each. For instance, traffic contribution is dynamically modulated according to hourly measurements of traffic counts. A background representing in-coming air masses in the domain of simulation is picked at an observation site in rural areas close by the. It is added to the contributions of local emissions to obtain hourly pollution maps. With this procedure, for example, 10 years of hourly pollution maps at 5m of resolution have been generated for the city of Lausanne.